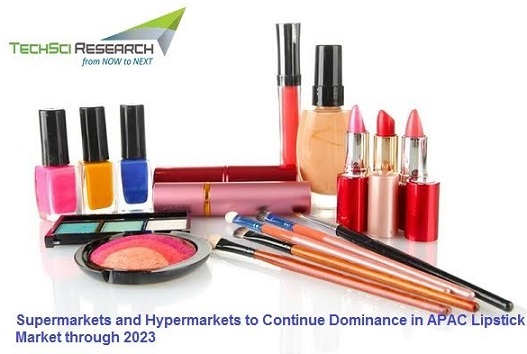 According to TechSci Research report, ‘Asia-Pacific Lipstick Market By Product Type, By Distribution Channel, By Country, Competition, Forecast & Opportunities, 2013–2023’, Asia-Pacific lipstick market is projected to reach $6.6 billion by 2023. Growth in the market is led by expanding working women population, who are increasingly showing inclination towards cosmetic products including lipstick, coupled with new product innovations by leading lipstick players. Lipstick is a cosmetic product which contains oils, waxes, pigments and emollients that provide texture, color and protection to the lips. Lipstick contains carnauba wax, beeswax, candelilla wax which enable the mixture to take a recognizable lipstick shape which can be filled in a tube. Further, lanolin, mineral, castor or vegetable oil are added to the wax. Apart from wax and oils, preservatives, antioxidants, pigment and fragrances are also added to the lipstick. L'Oréal International, Christian Dior SE, and Shiseido Company Limited are some of the leading players in Asia-Pacific lipstick market due to their unique product portfolio and wide product offerings under multiple brands. Browse 35 Figures spread through 63 Pages and an in-depth TOC on "Asia-Pacific Lipstick Market"
“Changing lifestyle pattern due to growing urbanization and rising disposable income is shifting consumer focus towards lifestyle and luxury products which is likely to fuel growth in Asia-Pacific lipstick market as well. Moreover, lipstick, which was once considered a lifestyle product has now become increasingly affordable. Further, inclination towards natural and organic lipsticks is rising, as they are less harmful besides being cruelty-free as they are not tested on animals. Additionally, continuous product development and growing demand for convenient and attractive packaging would further steer growth in Asia-Pacific lipstick market during forecast period,” said Mr. Karan Chechi, Research Director with TechSci Research, a research based global management consulting firm.